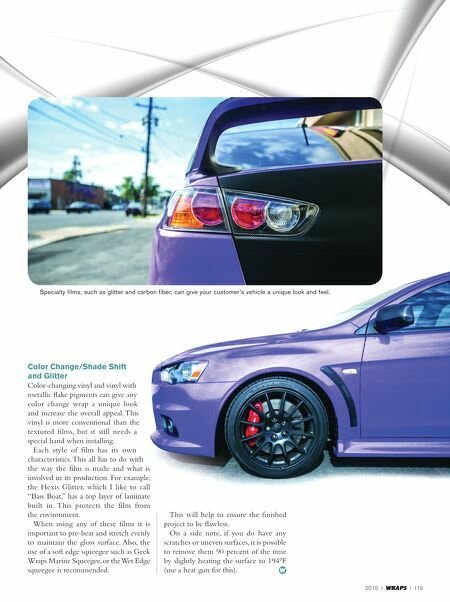 2015 I WRAPS I 119 Color Change/Shade Shift and Glitter Color-changing vinyl and vinyl with metallic flake pigments can give any color change wrap a unique look and increase the overall appeal. This vinyl is more conventional than the textured films, but it still needs a special hand when installing. Each style of film has its own characteristics. This all has to do with the way the film is made and what is involved in its production. For example, the Hexis Glitter, which I like to call "Bass Boat," has a top layer of laminate built in. This protects the film from the environment. When using any of these films it is important to pre-heat and stretch evenly to maintain the gloss surface. 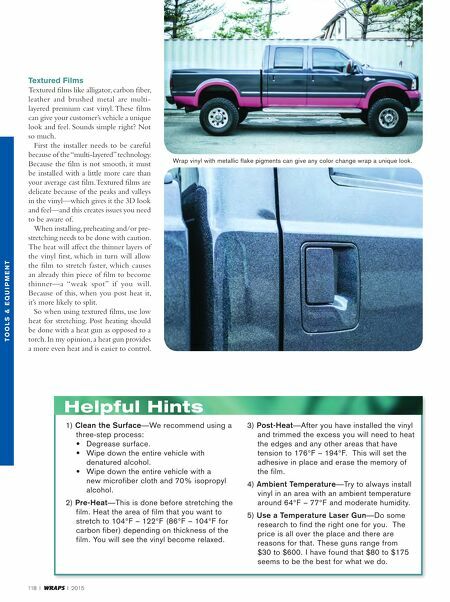 Also, the use of a soft edge squeegee such as Geek Wraps Marine Squeegee, or the Wet Edge squeegee is recommended. This will help to ensure the finished project to be flawless. On a side note, if you do have any scratches or uneven surfaces, it is possible to remove them 90 percent of the time by slightly heating the surface to 194°F (use a heat gun for this). Specialty films, such as glitter and carbon fiber, can give your customer's vehicle a unique look and feel.